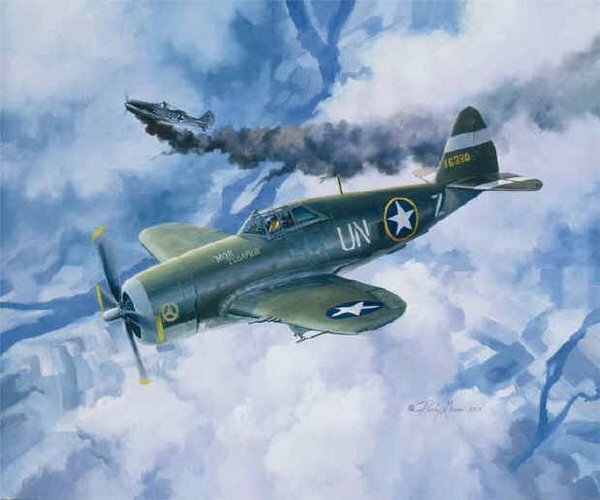 Printed on museum quality archival paper with an overall size of 16" x 20"
Colonel Hubert "Hub" Zemke, Commanding Officer of the 56th Fighter Group (the "Wolfpack") flies past his victim, an FW-190 high over Germany during March of 1944. Hub Zemke was one of the greatest Fighter Group Commanders of the European Theatre of Operations (ETO), along with his counterpart at the 4th FG, Don Blakeslee. Zemke's 56th Fighter Group, the "Wolfpack," was credited with 665 aerial victories, leading all fighter groups in the ETO. Zemke himself had 17.75 confirmed victories in 154 combat missions. Hub Zemke spent the first part of the war on liaison missions to Russia and England before taking over as CO of the 56th Fighter Group in September 1942.